Come along with me to see how to make your head table decorations and wedding backdrops simply amazing ... with balloons, bows, tulle, lights and matching accessories! 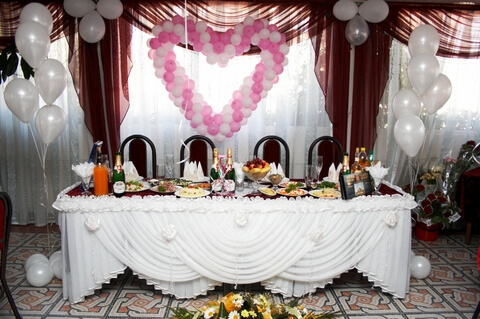 The balloon heart and floor standing balloon bouquets frame the head table beautifully. You want the head table to look extra special and all the same compliment the style of the whole reception decor. Whilst there are virtually no limits to the colors and styles you can choose from, there will always be the same elements you need to consider. Let's go through each of them. As you don't want to obstruct your guests' views to the wedding couple, it is best not to use a balloon centerpiece for the head table. Instead you could use low flower arrangements that match the floral bases of your balloon bouquets on the guests' tables. Some couples simply use the bridesmaids' bouquets to add colorful accents to the head table. Handmade bows are an effective way to turn a plain white tablecloth in a beautiful wedding head table decoration. Combine them with 5" balloons and ribbon or tulle swags for the perfect look. Use either velcro or fixing pins to attach the bows to the table cloth. You could either make the bows yourself from scratch (please watch the video below for instructions), or you could buy pre-made wedding pull bows. Make sure to have them shipped flat. They will form in seconds by pulling two inner strings. 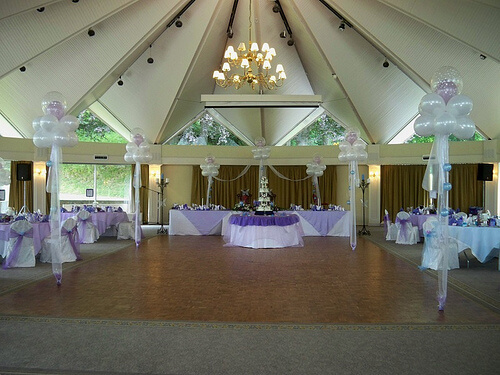 Majestic balloon columns on either side of the head table are a "must" for your head table decorations. There is no better way to highlight the focal point of the wedding reception. A popular design is the combination of plain balloons and balloons with ivy print, supplemented with tulle and silk ivy garlands, and crowned with a giant clear balloon, stuffed with loads of smaller ones. 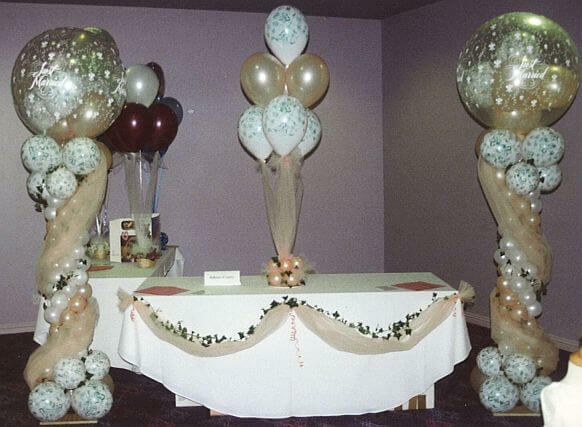 These two majestic balloon columns give your head table a festive look. One of the most beautiful wedding backdrops are balloon clouds, often called "cloud nine", connected with swags of ribbon or tulle, floating like heavenly bodies behind the couple and the wedding party. Or place a large spiral balloon heart behind the bride & groom. Balloon columns with tulle streamers and sparkling lights spanning between them would be another possibility.